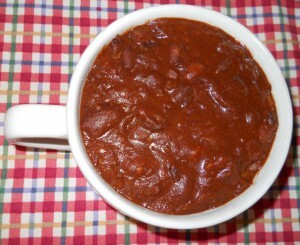 We prepare this sweet potato chili recipe in a 6-1/2 quart slow cooker (Crock-Pot). If you have a smaller slow cooker, or wish to make a smaller batch, cut the recipe in half. This recipe will take about 8-12 hours of cooking time, so we begin cooking the beans the night before we wish to eat the chili, adding the other ingredients in the morning, and letting it cook on “low” until we are ready to eat. Begin by turning the slow cooker on to “low” and pouring in 12 cups of cold filtered water. Clean and wash the beans and add to the slow cooker (all the beans should be covered with water). Cover. Allow the beans to simmer over night. In the morning, peel and wash the onions and sweet potatoes. Dice the onions, and cut the sweet potatoes into small cubes, not exceeding 3/8 inch (1 cm.) in any direction, and add to the pot of the slow cooker, and mix well. Open the cans of tomato paste, and add to the slow cooker. Add all the other ingredients, mix well, and cover. Allow the sweet potato chili to simmer for 3-4 hours until the onions are semi-translucent, and the sweet potatoes are soft. Mix well, serve with a large tossed salad, and enjoy! Do We Believe and Trust in God?